Australian Buyers who can accept container orders. Smaller orders are welcome, but please note freight cost to Australia can be expensive. Calling all Nintendo and Super Mario fans, we have an exciting coin arcade machine just for you! We have the Super Mario Bros Wii Coin World Arcade Machine available. We also have a very special offer on a Trans-Force Orion 5D Attraction 4 Seat Model Simulation Machine. This unique and special arcade machine, is a 5D interactive motion simulator which offers a variety of different games. We are happy to announce that we have the exciting new game Seafood Paradise 2 Plus is now available as an 8 Player Machine, or Game Board Software upgrade. We also have a great range of used game boards available include Tekken 5, King of Fighters XIII and Pop n Music 20. Huge range of brand new machines available including the new release Seafood Paradise Plus 2, TeraToma, Monster Eye 5D and more. Our popular games Ocean King 2 and Ocean Star 3 are still available and shipping regularly. Order now to make sure you have a machine in the next production! We have received hot pricing on Andamiro Arcade Machines such as Winners Cube DX, Pump Jump, Penalty Shot DX and Color Rangers. All machines are brand new and priced to go. 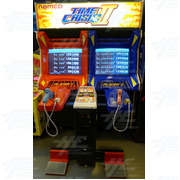 Furthermore we have great pricing on a wide range of popular arcade machines such as Monster Eye 5D, TeraToma, Time Crisis 5, SnoCross, Storm Racer G and more! Latest PIU 2015 game boards and HDD upgrade kits now available. Also we have bulk redemption machines and kiddy play centre on clearance. Looking for the latest music machines? How about Jubeat Saucer, Project Diva Future Tone, and Sound Vortex 2 - all available from our Hong Kong warehouse. Also we have 1 set of Initial D8 Twin. Bulk Sega Blast City cabinets available for immediate release, as well as clearances on the coin operated XBOX360 Game Gate machines. Great savings also on Pump it Up Infinity LCD machines.